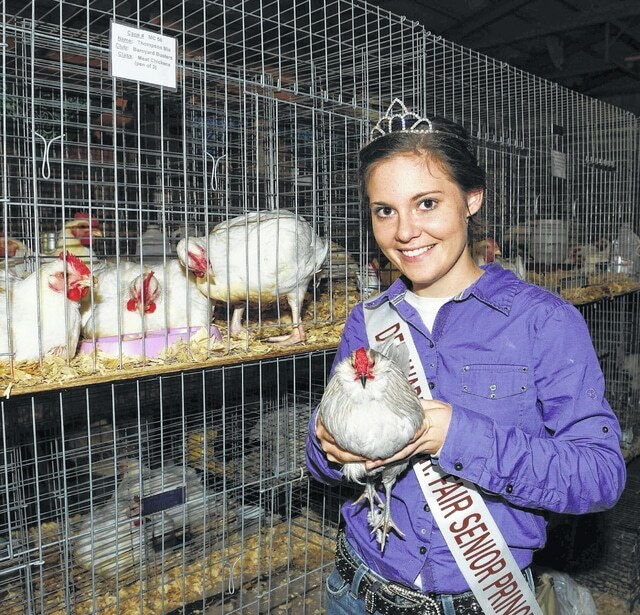 In past years it was a common sight to see 4-H Club members proudly showing chickens and turkeys at local fairs, like Maria Burger, shown here in 2013 at the Delaware County Fair. This year the poultry barns at fairs statewide will be empty, due to an Ohio Department of Agriculture ban on poultry exhibitions and projects to help protect Ohio’s poultry industry from the avian flu. The ban includes the Hartford Independent Fair, the Delaware County Fair, the Ohio State Fair, and all other gatherings of birds for show or for sale, including auctions and swap meets. All live bird exhibitions at Ohio’s fairs during 2015 have been cancelled, including at the Hartford Independent Fair and the Delaware County Fair. A press release from the Ohio Department of Agriculture states that the ban has been initiated to help protect Ohio’s $2.3 billion poultry industry from the avian flu that has negatively impacted other poultry-producing states. The ban includes county and independent fairs, the Ohio State Fair, and all other gatherings of birds for show or for sale, including auctions and swap meets. Similar bans have been enacted in other poultry states. So far, Ohio is virus-free and the move is intended to continue that status. Ohio Department of Agriculture Director David T. Daniels said in the press release that the bird exhibition ban was a difficult decision because it means young people can’t show their birds at fairs, but it’s in the best interest of an industry. Big Walnut High School Ag Science teacher and BW/DACC FFA Advisor Jeff Stimmell said the main reason for banning the exhibition of live birds at fairs stems from the economic importance that the poultry and egg industry has in Ohio, the number two egg producing state in the nation behind Iowa. “The Ohio State University Extension service is working on alternative projects for students,” Stimmell said. “It’s important to take into consideration that students are gaining knowledge of animal systems through this situation. I’m going to encourage my students who are working with poultry and had hoped to exhibit their projects at the fair to take advantage of alternative opportunities such as AgriScience Fair Research projects to learn about poultry through research. Information on biosecurity from USDA APHIS for backyard flocks can be found at < healthybirds.aphis.usda.gov > or by visiting < ohioagriculture.gov >.